Kaplan LSAT, GRE, GMAT Practice Exams. Most graduate programs require an entrance exam as part of the application process. If you're considering graduate school, we offer free practice exams through Kaplan so you can prepare. You can take the practice exam either online or at a partner site in a similar format to the actual test. Resume & Interview Boot Camp. Our Resume & Interview Boot Camp workshop will test, stretch, and strengthen your resume writing and interviewing skills! Attendees will participate in a 15-minute session, which will include a mock interview and resume review from a Career Counselor or a Human Resources Practitioner from a local employer. They'll provide you with honest feedback on your strengths and weaknesses, as well as opportunities to improve. If you are preparing for your first or next job opportunity, this is a great way to practice your skills and learn how to prepare. Click on the schedule for details on dates, times, and locations of each event. 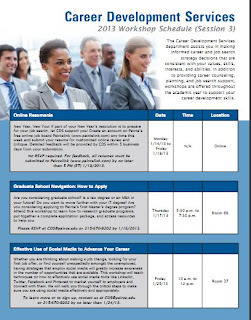 For each event, except Online Resumania, please RSVP by contacting us at CDS@peirce.edu or 215.670.9202. If the workshop you're looking for is not available, please contact us at 888.467.3472, ext. 9202, or CDS@peirce.edu, to make an appointment for a one-on-one session with a counselor. Keep your resolutions this year, and let us help you! We look forward to seeing you at our Session 3 events.